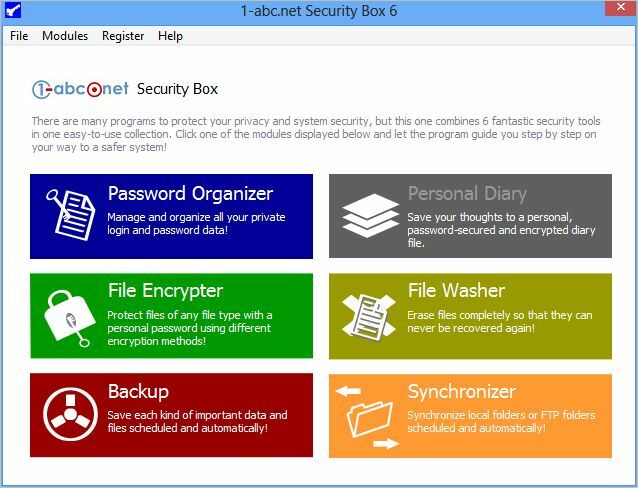 1-abc.net Security Box - Protect your data and secure your files! There are many programs to protect your privacy and system security, but this one combines 6 fantastic security tools in one easy-to-use collection. Six fast modules to improve your data security will guide you step by step on your way to a safer system! Many people nowadays do not really care enough about their data safety. Long before you create any files on your system, there can be the need to protect already the idea, the vision or just the simple thought. One module called Personal Diary helps you better than most other tools can do – just enter your personal password and make any note you want! Password management is something more that should be done right after creating a bank account, a shop login or a new e-mail address. With the included Password Organizer tool you can create and organize all your login and password data. Later, when there is important data worth to be protected, you should think about saving it to other places on your system or on external drives. 1-abc.net Security Box includes two more tools especially for this need: 1-abc.net Backup will save your important files and folders to other folders while 1-abc.net Synchronizer can compare files in different folders and copy always the newest one to both folders – even on FTP servers. If you want to protect your data from unauthorized use you can start File Encrypter to protect any file you wish with a personal password. And if you decide to delete data, you can use File Washer to erase it completely from your hard drive so it can never be recovered again. 1-abc.net Security Box – protect your personal data, encrypt or wipe files and save your important files scheduled and automatically! Password Organizer - Manage and organize all your private login and password data! Personal Diary - Save your thoughts to a personal, password-secured and encrypted diary file! File Encrypter - Protect files of any file type with a personal password using up to 10 different encryption methods! Backup - Save each kind of important data and files scheduled and automatically! Synchronizer – Synchronize local folders or FTP folders scheduled and automatically!